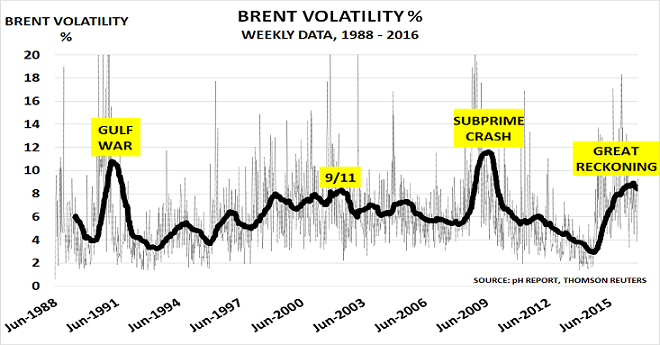 Volatility continues to dominate oil markets, as the above chart confirms. Some weeks have seen prices move by over 18%. These are extraordinary moves in a market which is very well supplied, with near-record inventory levels. Some recent daily moves are equally extraordinary, with prices jumping $2.50/bbl on Tuesday. The volatility highlights the power of the futures market to temporarily overwhelm anyone trading on the basis of physical supply/demand. As I noted last month, futures trading in just the WTI contract has averaged around 10x physical volume. So prices can take wild swings, without anything happening in the “real world” – especially when the automated high frequency traders get involved with their media-led algorithms. Tuesday’s move, for example, was caused by speculators buying 300 million barrels of oil via call options (betting that the price would be higher in H1 2017) – over 3x daily physical volume. This was why the price soared. The speculators particularly love “stories”, as these are impossible to prove or disprove. So the story this year about an OPEC/Russia production agreement has been perfect for their purposes. It is the “gift that goes on giving” as one major player told me. But at some point, probably quite soon, the story will run out of road – you can’t keep bouncing prices around forever on speculation, if nothing ever happens. “OPEC crude output rose by 230 kb/d to a record 33.83 mb/d in October after production recovered in Nigeria and Libya and flows from Iraq hit an all-time high. Output from the group’s 14 members has climbed for five months running, led by Iraq and Saudi Arabia. In October, OPEC supply stood nearly 1.3 mb/d above a year ago. It is therefore clear that OPEC has an uphill battle ahead of it. Of course, it is great fun, and highly profitable, to simply “wave away these facts” if you are a trader trying to profit from the “story”. But this is a zero-sum game: in other words, the trader’s profit is someone else’s loss. They are simply making money for themselves, and leaving the rest of the market to pick up the bill. Of course, it is possible to believe that that OPEC and Russia will be forced by the downside risk to make real, and major cuts. It is also possible to believe that “this time will be different”, and that most OPEC members won’t immediately cheat on the new quota, if an agreement is reached. Clearly every business that uses significant quantities of oil needs to prepare a Scenario analysis of the possible outcomes from the OPEC meeting. And this analysis needs to be realistic about the probabilities of success. Does OPEC have a 90% chance of reaching and enforcing an agreement? Is it a 50% chance. Or is the whole story merely wishful thinking, with just a 10% probability of happening? You have to make your own judgement. Equally important, of course, is that you then spend time thinking about what would happen to your business and investments in each of these Scenarios: if (a) prices rise to $60/bbl (b) stabilise around today’s levels, or (c) collapse below $30/bbl? It is essential that you spend time debating these possible outcomes today, and planning how you would respond to them. The key issue is that today’s oil market not being run for the benefit of people who actually use or produce oil. The speculators couldn’t care less who does well, or who goes bankrupt, as a result of their activity. They simply want to make the maximum amount of money for themselves, as quickly as possible. Essentially, therefore, it is best to see today’s market as a very high stakes poker game. And as any good poker player knows, “If you don’t know who is the fool at the table, then its probably you“. Central banks have acted as the proverbial tooth fairy towards financial markets in recent years. But they have not just left a small amount of money under the pillow when a child lost its first tooth. Instead they have printed trillions of dollars via Quantitative Easing (QE), to persuade investors to buy shares and commodities, and drive prices ever-higher. Their justification for this strange behaviour was a belief that this would create a wealth effect, and so somehow restore the economy to its BabyBoomer-led peaks. But now the Great Unwinding of these stimulus policies is underway, starting in China. And so prices on major world stock markets are falling as they return to more normal methods of valuation. Such trading strategies should never have been allowed in the first place, as these “legal highwaymen”add nothing to the process of price discovery – which is the fundamental purpose of any market. These complaints are just noise, however, hiding the real issue – which is shown in the chart above from Nobel Prizewinner Prof Robert Shiller. Over in Europe, ECB President Mario Draghi confirmed on Thursday he is happy to provide his share of the cash. But how easy would it be for the US Federal Reserve to reverse its current course? They have said their next move will be to increase interest rates – and nothing in Friday’s jobs report gave Ms Yellen any excuse for further delay. It could be quite a volatile autumn if the tooth fairy fails to appear. Whisper it quietly to your friends in the futures markets, who are convinced oil prices will soon surge higher. We don’t want to upset them as they work at their spreadsheets, and send their electronic trades down specially constructed lines at near the speed of light. That really is quite a lot of surplus oil. And the US is doing particularly well at building surplus inventory, as the chart shows. Its levels remain at record highs, with the latest weekly figure 13% higher than a year ago. “Wall Street’s generous supply of funds to U.S. oil drillers helped create the American energy boom. Now that same access to easy money is keeping them going, despite oil prices that are languishing around $60 a barrel. The oil cartel OPEC have similarly been taking advantage of their generosity, producing 1mb/d above its quota in May, and 1.8mb/d about its forecast for demand. The problem is that a whole generation of oil traders have never known a period when prices were set by markets, not central banks. They therefore assume these vast surpluses can therefore somehow be wished away. But instead, their money is leading to a bigger bust for oil prices down the road, not the boom that they expect. The amount of cash being poured down holes in the ground to produce more oil is vast – $16.7bn of secondary equity offerings took place in Q1, the highest since the boom began in Q3 2010. And at the same time, the drilling companies are becoming much more efficient in their operations. Investors who continue to ignore these developments will get a wake-up call of their own one day, as the oil price resumes its decline to historical price levels around $30/bbl. The CEO of HFT firm Tradebor said in 2008 ”his firm had gone four years without a single day of trading losses“.